Albion Awakening: Here be Giants! The original inhabitants of the island of Albion - or Merlin's Enclosure, as it was first called, Merlin being the presiding deity - were a race of Giants. Indeed, the name of Albion comes from their king. When the island was first settled by normal-sized Men (Brutus the Trojan and his followers - great grandson of Aeneas) - it was necessary to defeat resident Giant population. Gogmagog was the most famous of these - apparently a small and weak example of the race. However, a remnant of Giants continued as an occasional menace for a very long time afterwards. Thus Geoffrey of Monmouth - Albion's primary mythographer. Giants crop-up in many historical, religious, legendary and mythical sources, from all over the world; so there is no good reason to doubt their reality - except that we don't seem to have any nowadays. Much the same applies to the races of elves/ fairies and to dwarves - there is ample evidence for their existence in earlier time; far more evidence than for most supposed facts of history. But of course, that does not mean that Modern Man would be able to perceive Giants, fairies or dwarfs, even if they were present - since we are self-blinded to much of the primary reality of this world; and furthermore treat as dogmatically-real many things which are imperceptible and undetectable (except by long chains of insecure and labile inferences). There is no reason why all Giants, everywhere and at all times, should be identical; but it seems that at least some were intelligent as well as strong. The great feats of building attributed to them could not have been accomplished solely by muscle-power. The idea that giants were stupid seems like a modern slander, since they had their own long-lasting civilisations all over the place - but I suspect that were were easily tricked, and outwitted, by the normal-sized Men who replaced them. Perhaps childlike, naive and instinctive rather than idiotic. 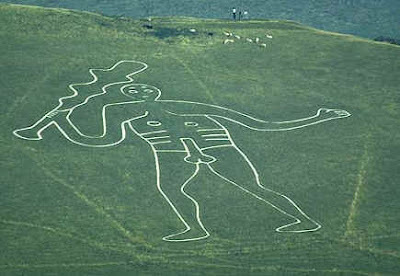 Or perhaps some Giants were magical, and used that rather than 'technology' to perform their feats - indeed, since early man was certainly able to do magic, it seems likely that Giants were too. Giants don't, for me, have the fascination of fairies, nor the common sense imaginability of dwarves; yet perhaps they ought-to. It just needs a great storyteller or two, to help us picture and empathise-with them. A splendid post, Bruce! I used to live near the Long Man of Wilmington (Eastbourne) and spent some time traipsing over the downs round there. 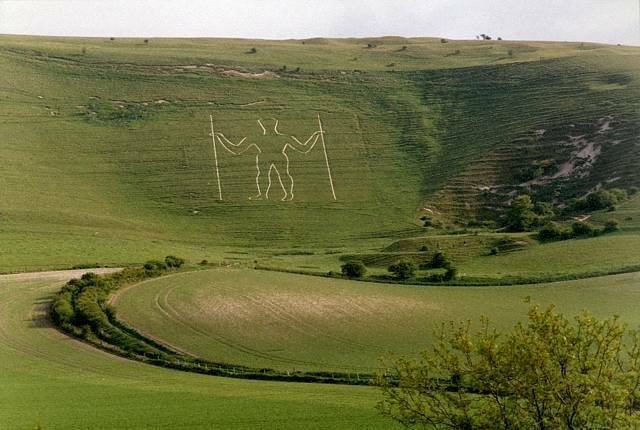 I also knew the Cerne Abbas gentleman quite well from when I lived in Dorset in the late'80s but I didn't know his appendage wasn't original. That actually make shim more interesting I would say, i.e. he's not just some fertility image which is rather dull. Regarding giants, their presence in many mythologies, particularly Norse, of course, does indicate that something is going on. I look forward to the day, though it probably won't be in this life , when the early history of humanity becomes clearer. It will be nothing like we imagine now, of that I'm certain. For one thing, I have not a shadow of doubt that civilisation goes back a lot further than we currently admit. There have been disasters that have wiped away much of the past leaving just a few witnesses like the Sphinx etc. @William - Thanks! Glad you liked it. It would be interesting if half a dozen giant skeletons were found somewhere at some time. That would really put the cat among the pigeons! As far as I know, the largest known species of Homo is our own, and the largest known primate (Gigantopithecus) was only 9 or 10 feet high. And, while there are certainly many megalithic structures that look as if they were "built by giants," I know of no artifact that was obviously designed to be used by a giant -- no armor, furniture, hand tools, etc. that are clearly to big to be used by an ordinary human. The biblical giants (nephilim) are identified with the "mighty men of old, men of renown" and were the offspring of the sons of God and daughters of men. This would seem to connect them with such figures as Hercules, Perseus, Achilles, and Ajax -- descendants of "Zeus" and other such gods. Ajax, at least, is described as a giant. Giant skeletons have indeed allegedly been found from time to time, and Joseph Smith was connected with one such discovery (details here). This giant was estimated to be about 9 feet tall, which is also the reported height of Goliath, Gigantopithecus, and Bigfoot -- so perhaps 9-foot giants are likelier than the 12- to 18-foot ones you propose. Also perhaps of note is the fact that so many accounts of the "hollow earth" (The Smoky God, for example) feature giants. @WmJas - I agree that simply a scaled-up human is not biologically likely, maybe impossible. Do you lend any credence to the notions of Graham Hancock? @Anonymous (please use a psudonym) - I don't think I know this author's work. I have read plenty of stuff about Atlantis and (like Tolkien) find the subject fascinating, and I'm sure that there is something to the legend of a highly developed, magical, lost Ancient civilisation in The West - but I'm not sure exactly what.